The Gungahlin Community Council (GCC) is a voluntary, not for profit, community-based association operating in the Gungahlin district of Canberra, in the Australian Capital Territory. Their objective is to preserve and improve the social, cultural, economic and environmental well-being of Gungahlin and the Gungahlin community. 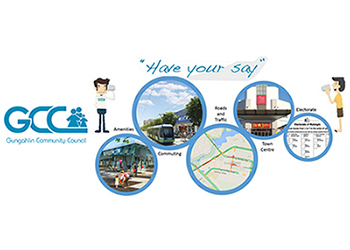 The GCC holds monthly public meetings at Gungahlin Library.